The Motorcycle Industry Council feels momentum is now on its side in its effort to re-legalize youth motorcycles and all-terrain vehicles, which flunk CPSIA’s ban on lead-containing alloys. [MotorcycleUSA.com] More background here and here. On Thursday Henry Waxman’s House Commerce Committee finally held its long-promised hearing on the Consumer Product Safety Improvement Act, the first such hearing by a committee with legislative jurisdiction since the calamitous law went into effect in February. (The Small Business Committee, a panel with no legislative authority over the law, had gone first.) As noted last week, Thursday’s virtually dissent-free event hardly counted as much of a hearing, since Waxman turned down all pleas to allow testimony from actual affected businesses or other critics or victims of the law. Instead he called as his single witness recently appointed CPSC chair Inez Tenenbaum, who hewed closely to the line he (Waxman) wished to hear. A Washington Times editorial is appropriately scathing, and Rick Woldenberg has much more about the committee majority’s finger-in-ears response to the broad outcry over the law. Ranking Republican Joe Barton (R-Texas), who supported the law’s passage, did say that “we have all been inundated” with constituent messages about its ill consequences. The Handmade Toy Alliance has published the statement that Jill Chuckas of Crafty Baby would have made if invited to testify (more). By a unanimous vote, the CPSC recently confirmed that Mattel, the giant toymaker whose many recalls helped touch off the lead-in-toys panic in the first place, has qualified for an exemption from third-party (outside lab) testing of its products under CPSIA, and can instead test in its own in-house labs. Of course, most of Mattel’s competitors are less fortunate and do not operate on a scale that will make such an exemption feasible. The exemption for “firewalled” in-house labs, deemed by one critic a “hall pass,” was something Mattel obtained through intense lobbying back when the law was under consideration. Like the other giant in the business, Hasbro, Mattel actively lobbied for CPSIA’s passage, and even as the law has brought undreamt-of woe to thousands of smaller producers of kids’ products, the two big companies seem to be doing rather well under it. More: Timothy Carney, Washington Examiner; Brad Warbiany, Liberty Papers; Christopher Taylor, Word Around the Net. Other reactions to the exemption: Holly Jahangiri, Rick Woldenberg, Ed Morrissey/Hot Air (“one of the companies that created the problem in the first place has gotten a waiver”), Katherine Mangu-Ward/Reason (“Mattel now has a cost advantage on mandatory testing, and a handy new government-sponsored barrier to entry for its competitors”), Handmade Toy Alliance. What’s going to replace forbidden phthalates in kids’ products now that CPSIA has banned them? Probably alternative plasticizing chemicals about which we know less, notes Andrew Langer in Roll Call. It’s old news, of course, that the CPSC asserts the power to go after eBay and Craigslist sellers, church bazaars, homeowners who hold yard sales and other sellers of used items that do not comply with CPSIA and other safety standards (although evidence is very sparse that most members of Congress actually realized the law would reach sales of those kinds.) Last month the CPSC saw fit to announce “Resale Roundup”, a new crackdown on secondhand sales. It also revised its book of guidance for resellers, in ways Rick Woldenberg finds less than enlightening. Discussion: Adler/Volokh, Ed Morrissey/Hot Air (“What did we ever do before the CPSIA protected the US through its throngs of federal nannies? How did we ever survive garage sales in the past 233 years?”), Washington Times (“from yard sales to jail cells”), Katherine Mangu-Ward/Reason, John Stossel, Deputy Headmistress/Common Room (“Remember when Congress assured us that the little guys had NOTHING to worry about with the CPSIA because they weren’t going to come after us? They. Lied.”) On the brighter side, McClatchy’s James Rosen quotes spokesperson Scott Wolfson as saying the commission isn’t planning to seek admittance to inspect private homes and garages to enforce the law. So be thankful for small favors. 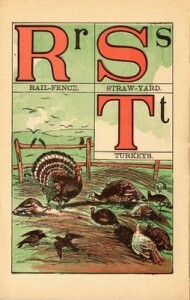 PUBLIC DOMAIN IMAGES from Ethel Everett, illustrator, Nursery Rhymes (1900), and (illustrator not known) Farm Yard ABC (c. 1880), both courtesy ChildrensLibrary.org. A fine hearing/My friends, this is… Rep. Waxman’s plan for a dissent-free panel this Thursday (Sept. 10) is to call as the only witness CPSC chair Inez Tenenbaum, to talk up the merits of the law and her efforts as new steward of the agency. It’s not as if the law’s controversial or anything! The Handmade Toy Alliance wonders whether he’ll get away with it. A compulsory subpoena could follow if they don’t fork over information on “compensation of highly paid employees” and “expenses stemming from any event held outside company facilities in the past 2 1/2 years”, among other topics. As AP notes, industries that vocally support, rather than oppose, health care reform aren’t targets of the investigation. More: Politico. Robert Ambrogi at Legal Blog Watch criticizes the trial lawyers’ association for excluding the press from its annual convention, but the tactic seems to have worked pretty well in lowering the group’s lobbying profile and deflecting serious coverage of the parade of politicians, from Nancy Pelosi to Henry Waxman to DNC chair and Virginia governor Tim Kaine, who have made the pilgrimage as speakers to pay their respects. More: AAJ’s response. Isn’t there a wealth of worthwhile children’s literature published since 1985 for kids to read? [Older books,] as a group, have certain desirable characteristics. 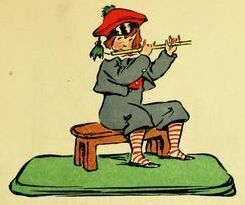 Children’s books of yore tend to use more sophisticated, literary language than their more recent counterparts. The quality of their paper, bindings, and illustrations are often superior. Vintage children’s books assume and encourage the readers’ fascination with adventure, their eagerness to learn about the world, their respect for great men and women. Some books from the 1950s and 60s are back in print, but with updated illustrations so the characters appear to be from our time; if that’s what it takes to lure readers who are wary of anyone who doesn’t look like them to pick up the books, it’s probably fine, but there is also value in presenting books with a style of illustration and characters with a style of dress from a different time, and that’s what we get with old copies. Some books, such as the Hardy Boys and Nancy Drew series, are thoroughly “updated” for today’s readers—simplified, abbreviated, substituting familiar words for those no longer commonly used—so if a child is going to read the originals he needs to read old copies…. Some old books, it is true, express ideas and attitudes of which we would disapprove, prejudices and errors that make modern readers wince. But learning about such sentiments firsthand is at the heart of what it means to learn our history. Moreover, while correcting some of these past problems, our present age has its own objectionable attitudes. 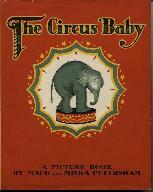 Won’t older children’s books still be available when intended for adult use, say as collectibles or for research? But the availability of these books to children is the very purpose and value of preserving them. We want them in children’s hands, being read, not only preserved on the dusty back shelves of research libraries. Quantities are important — quantities of titles, and quantities of each title, so they are readily available for loan from public libraries and for purchase through used booksellers. Families have been able to build home libraries through priced-for-reading book sales and thrift stores. … We are suddenly facing the prospect that many of these books will be destroyed, making those that remain all the more rare and inaccessible. Some used booksellers, trying valiantly to continue selling books for children, are re-labeling their children’s books as collectors’ editions. But this obscures the books from searches by those looking for ordinary children’s books, it clutters the market for real collectibles, it makes the bookseller look ignorant of his trade, and it is prohibited under CPSIA, which stipulates that a book “commonly recognized” as being meant for children’s use will be regulated as such. The article’s strength, I should note by way of quibble, is not as legal advice: it somewhat overstates the stringency of the law, which does not ban the sale of all untested pre-1985 kids’ books as such, instead exposing booksellers to punishment when they guess wrong about whether a given volume would meet current standards (hence the CPSC’s guidance advising retailers to discard them all). And the call for “sequestering” library copies has thus far come from only one member of the three-member CPSC, not as yet the full commission. As a summation of what will be lost to children and the nation if Congress does not change this law, however, the article is one of the best yet. Read it here. And since Rep. Henry Waxman, closely identified with CPSIA and its defense, has a new book out, Carter Wood at ShopFloor wonders whether this topic is going to come up at any of his bookstore appearances. P.S. Fenris Lorsrai at LiveJournal reprinted the Nicol article and in so doing prompted some interesting reader comments. Apparently there are a lot of hidden surprises in this Waxman-Markey “cap and trade” energy/environment bill we’ll be hearing about in coming weeks [Washington Post via Virginia Postrel]. At long last a House committee — the one on Small Business — has announced a hearing on CPSIA’s impact on small business, to take place Thursday. (I’m almost hesitant to report this as good news since the last time I did so it took only hours for the event to be called off). The Small Business panel does not have primary legislative authority in the area; that is vested in Rep. Henry Waxman’s Energy and Commerce Committee, whose CPSIA-overseeing subcommittee has chosen instead to hold hearings on that very urgent subject of public concern, college bowl championships. Rick Woldenberg recalls the fingers-in-ears techniques the House has used to shut out unwanted information up to now: first Waxman/Rush staffers prearranged “hearings” that heard nothing, after which they (successfully up to now) maneuvered to make sure critics of the law would not obtain any official Hill forum at which to air their grievances as public outrage built. The Consumer Product Safety Commission has released new guidance (PDF) for thrift shops and other product resellers on compliance with CPSIA and other laws overseen by the agency. According to Ian at Musings at a Catholic Bookstore , the manual lays out policies that differ only slightly from what was known before, often by spelling out what will be made an enforcement priority, since the commission has no power to alter the law’s actual requirements. Thus it seems phthalates in older kids’ playthings, the kind unlikely to be placed in the mouth, are not going to be a high priority in reseller enforcement — which still doesn’t make it legal to resell those items. For many outside readers the biggest surprise seems to have been that the agency views its authority as extending to yard sales. As Ian notes, this isn’t actually news; it’s just that the new manual is spelling it out in a more visible way than it did at some earlier times. In the ongoing series of crises that is CPSIA, the next major crisis is due on or around August 14, as of which date newly made children’s goods must comply with new tracking and labeling requirements (touched on briefly in this space last month). The intent is to make it easier to trace and contain safety problems, enable recalls and so forth. For makers of children’s apparel, Kathleen Fasanella explains the complicated and sometimes expensive implications in posts here, here, and here. 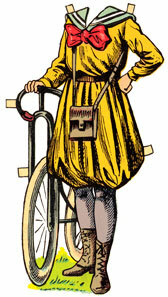 And apparel makers have it relatively easy, in part because they are already used to affixing permanent labels to most products, unlike many makers of items such as wooden toys and pencils, straw dolls, ceramic wall plaques, rubber spiders or bouncy balls, glass bead craft items, and so forth. Toy importer Rob Wilson writes, “this one clause will be enough to finish off a good majority of the companies that the other provisions of the law do not kill first. I personally know of many companies that are planning to close by August 15th if this provision is not amended.” The National Association of Manufacturers has requested (PDF) an emergency stay on the tracking and labeling rules; the CPSC has put off consideration of the request. Rick Woldenberg comments here and here. And tomorrow (Tues., May 12) at 1 p.m., the CPSC is holding a meeting, to which any interested member of the public is invited, to discuss the tracking and labeling rules. (Update: CPSC hearing is online as a webcast (h/t Woldenberg). Kathleen Fasanella has more, including links to more than 500 pages of protest letters, PDF, received by the CPSC on the issue). Cutting across multiple lines: per the Bulletin in Bend, Oregon, a local resident whose son got sick from salmonella (and recovered) appeared with Rep. Henry Waxman at a press conference to promote more effective federal food safety regulations; at the same time, though, “Christoferson said she can sympathize with the harm that poorly written rules can do to businesses” because her own resale store in the city of Bend, Stone Soup, has been harmed by CPSIA. Whimsical Walney, who has written with passion about the CPSIA fight, has announced that she is closing the doors of her children’s business. 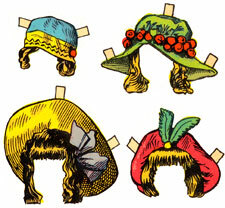 Public domain paper doll images courtesy Karen’s Whimsy.